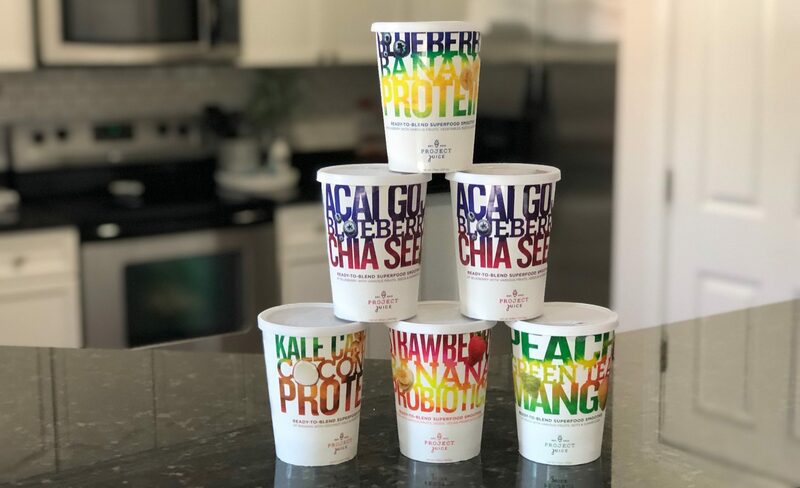 Sub-Zero Superfoods Smoothie Review + Promo Codes! Looking for easy ways to eat more superfoods? Sub-Zero Superfoods has you covered with delicious smoothies you can prepare in less than a minute. In this Sub Zero Superfoods review, we’ll help you decide if the service is a good fit for your budget, lifestyle, and health goals. What is Sub Zero Superfoods? Sub Zero Superfoods is a smoothie delivery subscription service. But instead of sending you fully prepared smoothies, which would probably melt in transit, Sub Zero makes it super easy for you to enjoy freshly prepared smoothies at home. 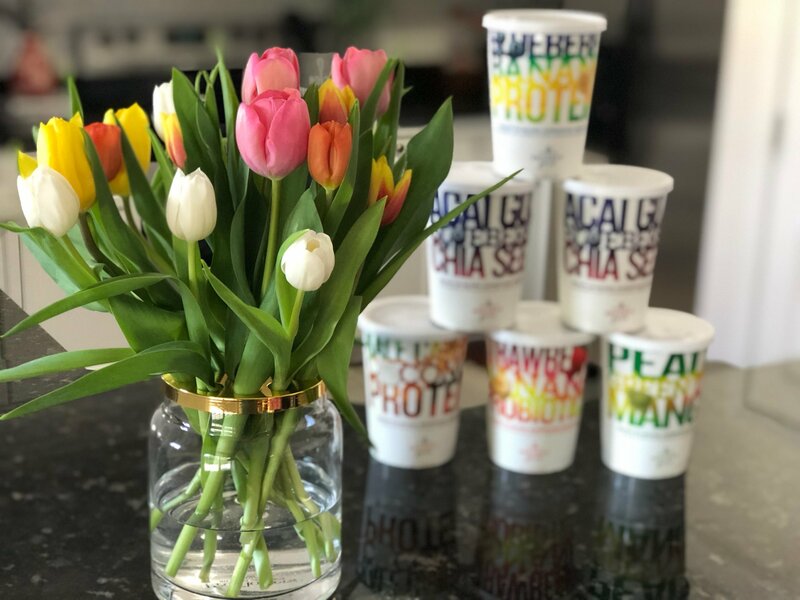 It sends you cups filled with frozen, pre-portioned ingredients. 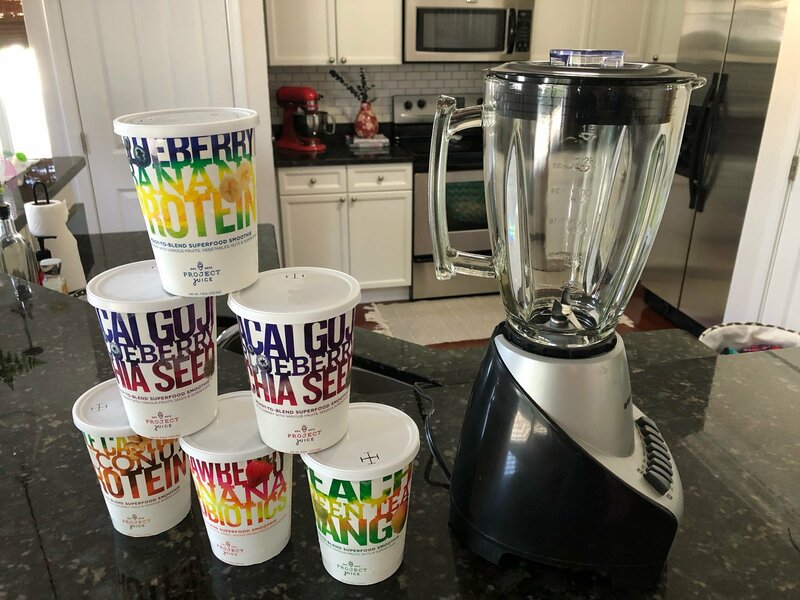 So all you have to do is dump the content into a blender, add milk or a milk alternative, blend the smoothie, pour it back into the cup, and enjoy. What flavors of smoothies does Sub-Zero offer? Are Sub Zero Smoothies Healthy? Sub-Zero’s ingredients are flash frozen to retain nutrient density. Smoothies are gluten-free, organic, and preservative-free. And since you add your own milk or milk alternative, you can also easily make them dairy-free too. With a milk alternative (almond milk, soy milk, etc), almost all Sub Zero smoothies are vegan. The only current exceptions is the Coffee Collagen smoothie (which contains bovine collagen). With fruits, greens, and protein smoothies, Sub Zero Superfoods is a tasty, convenient way to power up your diet in the areas where you need a tuneup. The protein smoothies contain between 12 and 20g of protein by the cup! That makes this a good place to mention that smoothie cups are actually two serving sizes, which is common. Personally, I just drink the full cup, but you can also share with a friend. Sub Zero Superfoods ships to all 50 states (even Alaska and Hawaii! ), which is very rare for a smoothie delivery service. They also offer more flexible delivery options than many of their competitors. 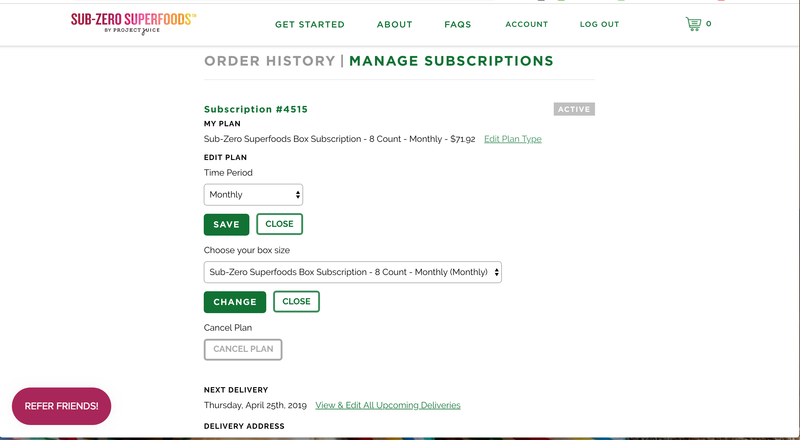 Then, post-purchase, you can decide how often you want your box delivered — weekly, every two weeks, or monthly. Sub Zero's current promotion is free shipping on your orders. You can get that deal simply by visiting their website, no coupon or promo code needed. Starting a new Sub Zero subscription is super easy. Just click the “Get Started” button on the Sub Zero website. You can then select one of their pre-set box selections or hand-pick exactly which smoothies you want to receive. If you want to learn more about a specific flavor, be sure to click on it. They have nutrition information, reviews, and fun facts about the ingredients included. After checkout, you’ll simply wait for your first order to arrive at your door! If you ever need to reduce the frequency of your shipments, skip a delivery, pause your subscription, or cancel your account, that’s all really simple too. From there, you can change how many smoothies you’re getting per shipment and how often those shipments are coming. I’m a big fan of Sub-Zero Superfoods smoothies. 1. It’s just so simple and timesaving. I tried making my own smoothies for awhile, but I quickly fell out of the habit. It was just too much work finding the recipes, buying the ingredients, and preparing everything. Plus, I pretty much had to be at home to ever make a smoothie because of all the prep involved. With Sub Zero, all I need is 60 seconds and a blender. It’s great for a quick breakfast, a light lunch, an afternoon snack, or a healthier dessert. 2. It satisfies my sweet tooth with less sugar. I have a huge sweet tooth, and the smoothies (especially the fruit ones), help me satisfy that in a healthier way. Before discovering Sub Zero, I was drinking pre-made smoothies from the grocery store, but some of those had almost 30 grams of sugar per-serving. In my experience, Sub Zero smoothies contain only about 7 - 11 grams of sugar per serving, with no added sugar. 3. It helps me eat more fruit. I’m already pretty good about eating my vegetables, but I’m not as good at including fruit in my diet. Sub Zero makes that easy and helps me eat a more balanced diet. And for people who like fruit but struggle to eat their vegetables, Sub Zero has lots of great veggie smoothies too. 4. It’s an easy source of protein. I try to workout around 4 times per week, and my biggest obstacle is finding the time. After driving to the gym, working out for an hour, and driving back, I need a post-workout snack that’s quick and easy to prepare. Sub Zero calls their protein smoothies “amazing for workout recovery” and I tend to agree. They all have between 12g and 20g of protein, and they taste really good. Sure, I could drink a pre-made protein shake in even less time, but I don’t really like the aftertaste and I prefer to get my protein from actual food. I’ve never seen another smoothie service that offers every-other-week delivery. And you can even go monthly. Cancelling and reactivating are both as easy as simply clicking a button. And since the frozen ingredients have a pretty long freezer life (with a printed “best buy” date), there’s flexibility there too. After reading this Sub Zero Superfoods review, want to give it a try? If I sound like a hype man here, it’s just because there’s really not much to dislike about Sub Zero, assuming you like smoothies. It’s a simple, timesaving concept. It’s more expensive than a DIY approach, so I guess you could call that a drawback. But right now, I have more money than time. So it’s a great fit for me. And to be honest, I’m not even sure if I could find all these organic ingredients at my local supermarket. If this Sub Zero Superfoods Review has made you want to give the service a try, just visit their website to get started!